Does your dog have a habit of jumping on people to greet them or get their attention? 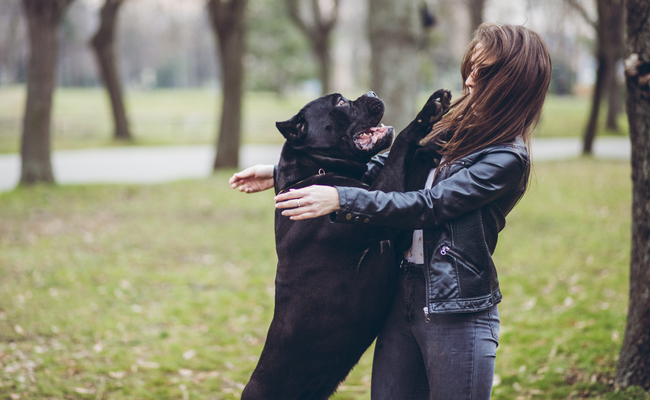 Sometimes it’s difficult to resist those happy puppy hugs, but jumping can easily turn into a behavior that’s a nuisance — or dangerous. Even if you’re generally unbothered by your dog’s actions, their jumping might frighten other people or knock them off balance — regardless of the dog’s size or age. But the good news is that with a little dedication, you can teach your pup to keep their paws on the ground. Here are six tips to help you stop your dog from jumping on people. A dog who jumps on people often is excited and seeking attention. So a major part of your training is learning to completely ignore your dog anytime they jump on you. And instruct everyone — family, friends and even people who briefly meet your dog — to do the same. Anyone who has contact with your dog must comply with this practice, or training will be confusing for the dog and difficult for you. Whenever your dog jumps, VetStreet recommends folding your arms across your chest and freezing until the dog backs off. Or you can completely turn your back to them. And don’t add to your dog’s excitement by yelling at them or pushing them, as they might just see that as part of the fun. To start, train your dog to reliably sit on command if they don’t already. Use healthy treats and lots of praise to really solidify the behavior. 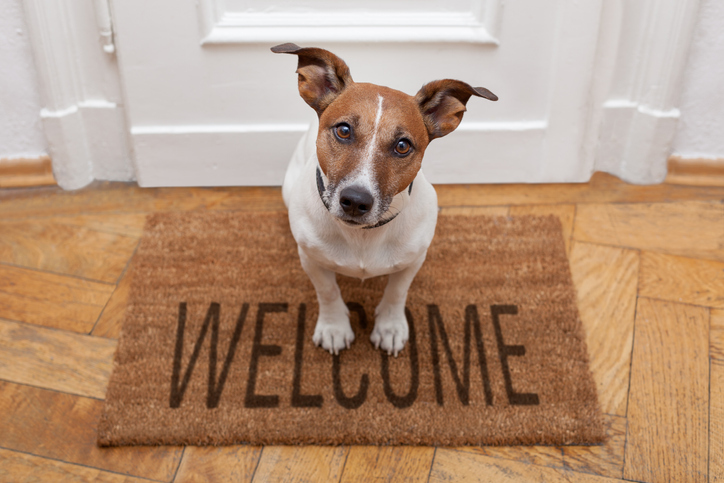 If jumping at the door is a problem, Best Friends suggests placing a mat or dog bed near the entryway of your home where your dog will sit and wait to politely greet guests. Teach your dog to sit on that spot, and reward them only when they hold their position. You can even come up with a special command, such as “welcome,” so your dog knows you want them to go to that greeting spot. But in most cases, a solid “sit” command should be enough. Then, you’re ready for some practice visitors. To really teach your dog what you want them to do — besides jumping — when someone enters your house, set up practice visitor scenarios. At first, just go through the motions alone with your dog. Place some treats outside your door, and make sure the mat or other spot where your dog will sit is in place. If your dog begins jumping, ignore them and wait. Don’t keep repeating the “sit” cue. Eventually they should learn that this is the same “sit” exercise they already know, just with you entering the door. Be sure to treat them every time they do it right to help it click. Once your dog is sitting upon your entry, add a knock or doorbell ring to the mix. Then, have family and friends come to the door as visitors. Ask your dog to sit as they enter, and have them treat the dog for good behavior. This might be a slow, tedious process — but it’s one that’s worth it in the end. If your dog is a very exuberant jumper whenever people arrive at your house, you might need to take further steps to achieve a calm greeting. VetStreet recommends fitting your dog with a front-clip harness or head halter — options that will help discourage jumping — and leashing them before you allow guests inside. “When your dog is calm, with all four paws on the floor — which may take up to a few minutes for more excitable dogs — allow him to approach guests and say hello,” VetStreet says. “If he jumps, gently turn and lead him away; wait for calm behavior before approaching again.” But never drag your dog or jerk on the leash. Make sure anyone who’s greeting your dog maintains a calm demeanor, so they don’t add to your dog’s excitement level. And don’t hesitate to ask the person to stop giving your dog attention if any bad canine manners start to creep back in. If greeting visitors is simply too exciting for your dog to focus on their training cues, sometimes distraction tactics can work. Keep these items handy by the door. And you can even try carrying a toy on walks to squeak or otherwise use to distract your dog. 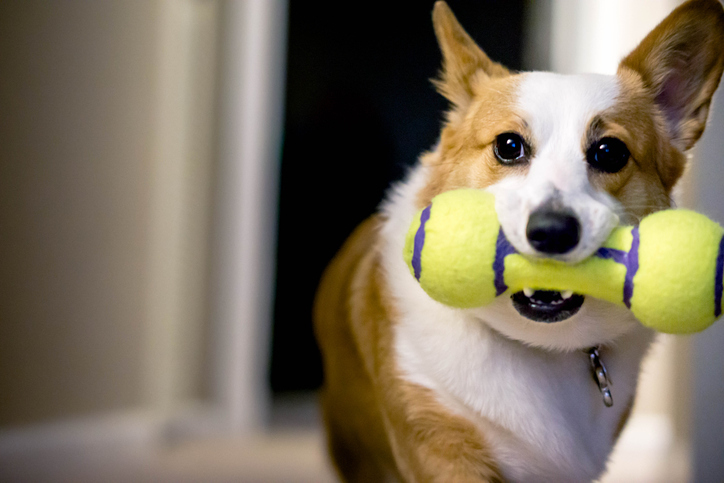 Likewise, VetStreet suggests starting a game of fetch as soon as visitors arrive to help channel your dog’s excitement. You also can toss treats on the floor, so the dog looks down instead of jumps up. If you can distract your dog for just a few minutes after a new person’s arrival, that’s often enough time for their excitement to diminish to the point where they’re not as motivated to jump. The best thing you can do when it comes to training your dog is to be consistent. Remember, your dog is always learning from you. Even if you have a no-tolerance policy for jumping during your training sessions, you have to keep that up as you go about your daily life for your dog to truly understand what you want. Take advantage of opportunities to practice their commands. Don’t get upset or discouraged. And always reward good behavior with petting, praise and treats. When we first get aa dog one of the things we teach is to NOT jump up on us or anyone. A knee to the stomach only one or two times stops the jumping for good.